Internet of Things (IoT) remains one of the hottest IT topics in 2015 with many experts from the variety of industries, from software development consultants and Cloud service providers to academics and chipset manufacturers, having shared their vision of where IoT is now and where it's heading in the future. 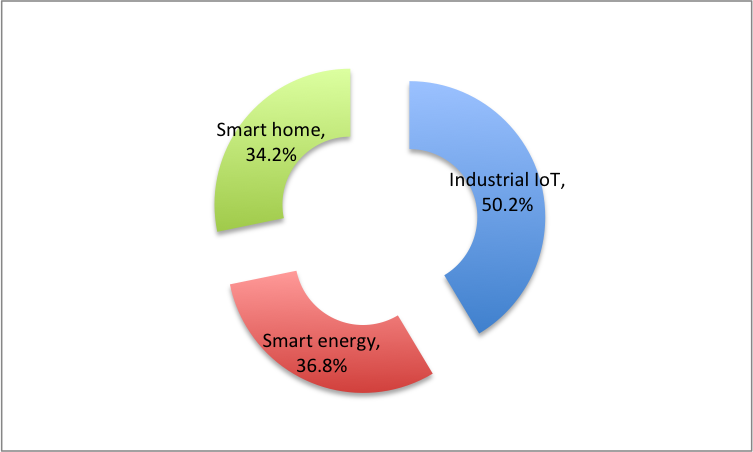 I've taken some time to evaluate their feedback and explore what the latest IoT studies have to say about the future evolution of IoT to identify both the key drivers of and the biggest inhibitors to the market adoption of the Industrial IoT (IIoT) concept. Is IoT still a puzzle you're trying to put together? REQUEST OUR FREE 'IOT IN A NUTSHELL' WHITE PAPER! Here're my takeaways from the recently published IoT Outlook Report by Telecoms.Com that is based on responses from nearly 1,000 IT professionals and delves into how enterprises will stand to gain as IoT reaches its maturity and goes mainstream. 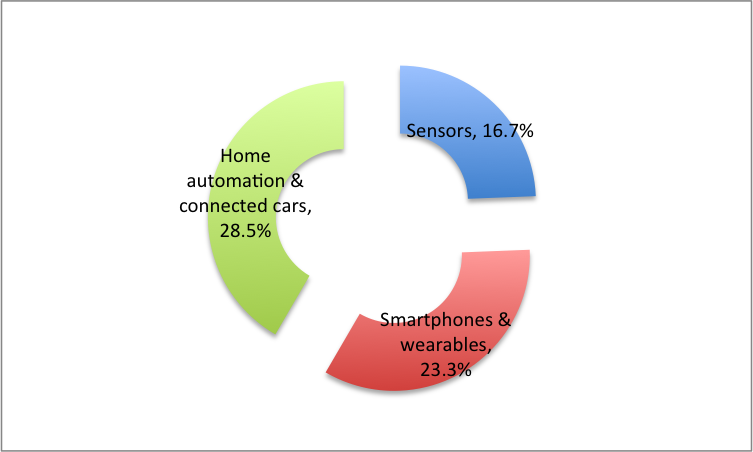 As seen from the image above, most of IT professionals surveyed primarily associate IoT with smart houses and connected cars, smartphones and wearable gadgets, and sensors. Smart cities, Big Data, RFID and tracking technology are associated with the evolution of IoT by only 15.5%, 8.4% and 2.1% of respondents respectively. Surprisingly and contrary to what's pictured in the mainstream media, only 5.5% of IT professionals actually believe IoT is primarily associated with domestic application of machine-to-machine (M2M) communications (e.g. smart fridges and talking toasters). When further asked to identify services that will be most lucrative in the next 12 months, over 50% of respondents pointed to IIoT, i.e. smart equipment controllers, energy efficiency and other outcome-based economy solutions, etc. 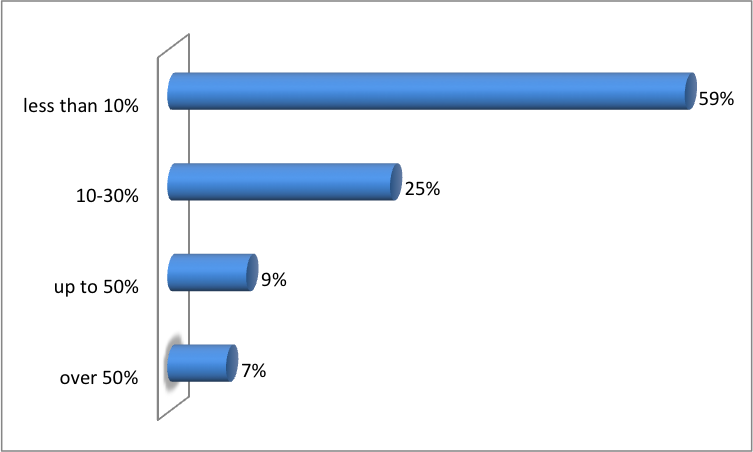 When asked how IoT revenues will contribute to company's overall revenue in 2016, 59% of respondents replied with "less than 10%". Most of IT professionals surveyed believe security, lack of platforms standardization and technology / device immaturity are the top 3 inhibitors to the IoT development. Further, the research finds that only 16.7% of technology service providers feel they're ready to monetize IoT now versus almost 25% of those that will be ready in 2016. This finding is attributed to the lack of security in the IoT stack! As many as 77% of respondents view IoT security as a corporate need that should be assessed very carefully prior to kicking off with the IoT development project. Nearly 45% of respondents consider 10% to 40% of all IoT data to be highly sensitive, while 33.8% suggest highly sensitive information could be carried by anything upwards of 40% of the entire IoT data. Do you need professional assistance building your IoT solution? According to the survey, nearly 24% of software development service providers are targeting 2020 for delivering ultimately secured IoT solutions, while less than 17% of providers will be ready to deliver fully secured IoT services in 2016! Now let's see whether software developers have been sold on Cloud for the IoT projects yet. 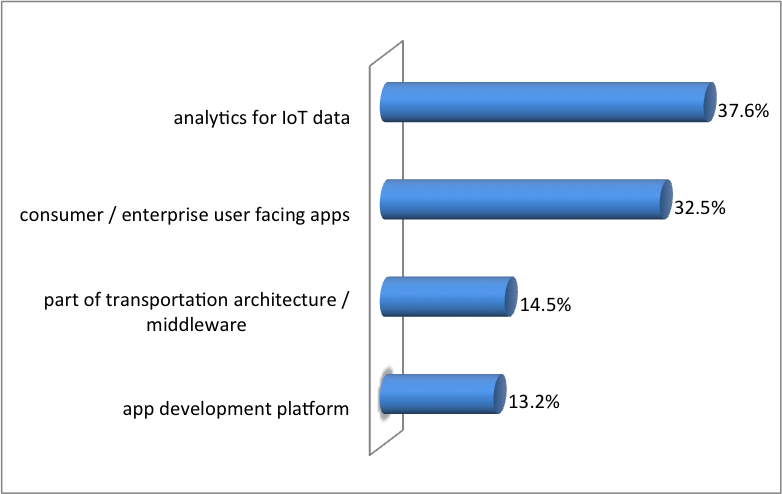 Almost 38% of developers believe analytics for IoT data analysis will be the most useful service when it comes to the Cloud-based offerings. 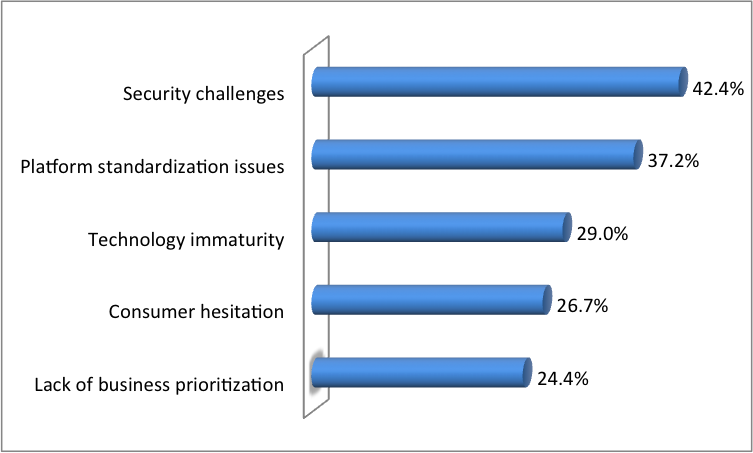 When asked about chief obstacles that prevent service providers from delivering successful Cloud-based IoT solutions to end users, almost 50% of organizations cited "immaturity of the IoT industry standards" and cumulative 60% replied with "lack of consumer awareness about the IoT" and "lack of employee skills / knowledge" to handle Cloud-based IoT. Further, roughly 63% of respondents believe Cloud-based apps are more suited to IoT services than on-premise, while 70% believe private cloud platforms had a better chance to power IoT services because of data privacy concerns. 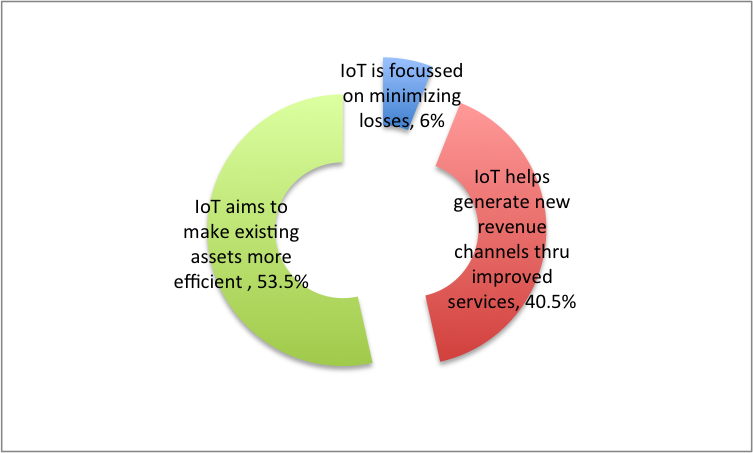 When it comes to the IoT monetization, the vast majority of survey participants say IoT in general and Industrial IoT (IIoT) in particular is focussed primarily on improving the efficiency of existing corporate assets. And what about you - are you ready to harness the power of IoT and bring added value to your clients and end users in 2016?